This golden birthday card would be perfect to express to your brother how much he means to you. Telling him how lucky you feel to have him as your brother could be the best birthday present he could receive. It will warm his heart and add joy to his day. The sparkling gold letters add a touch of class and look great against the black background. 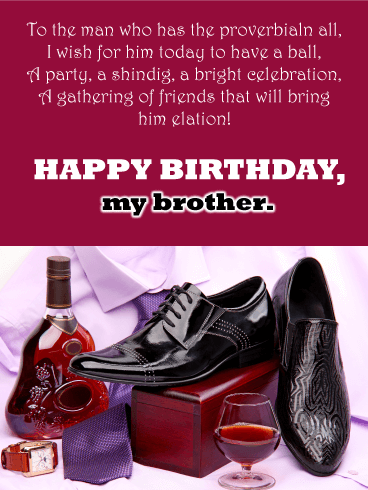 Send this birthday card to your brother without delay so he can enjoy it on his special day. I feel so lucky to have a great brother like you. Wishing you a birthday filled with special moments, fun times, and everything that is dear to you. I love you very much. 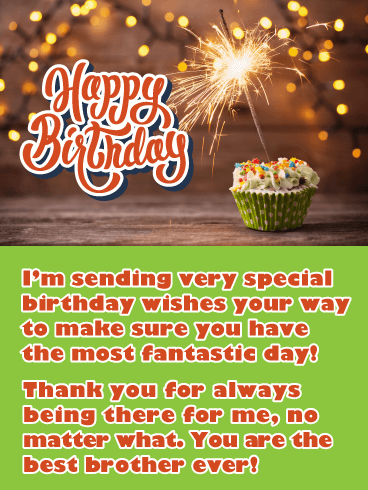 This fantastic birthday card has it all – an outstanding birthday cake with brightly lit candles, and a message that your brother will just love. The 2-tiered decorative cake was made extra special just for your brother to let him know how important his birthday really is. The message expresses that he is even more special as each year passes. 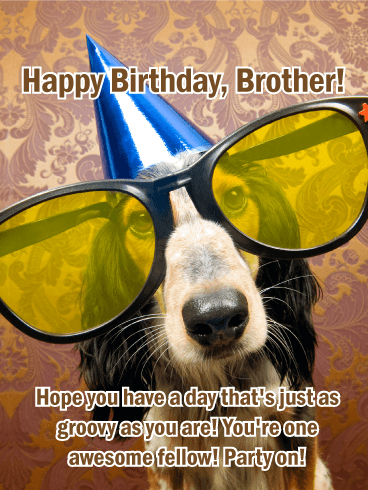 Let your brother know how much he means to you by sending him this thoughtful birthday card today! What's not to love about this gem of a card?! The dog in oversized sunglasses is hilarious enough, but throw in the variety of colors, fun background, and humorous verbiage and you have a definite win. For the fun-loving brother in your life, this birthday card is sure to be a hit! 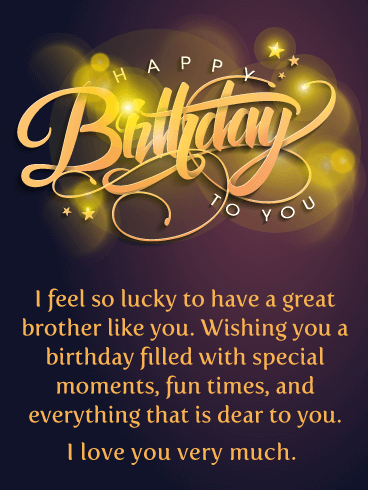 Send your brother a birthday card that will lift his spirits and bring a smile to his face on his special day. It features colorful balloons lifting a wonderful happy birthday banner high in the sky. It looks fantastic! 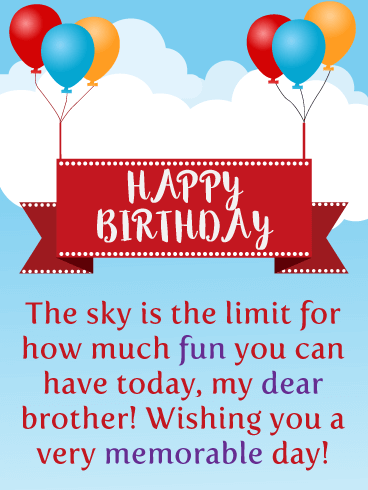 The message will remind your brother that the sky is the limit for the fun he can have on his birthday! Send this inspirational card over to your brother today! A silhouette of a golfer on the course at sunset decorates this card. Perfect for the brother who can be found putting around on a green in his spare time! Having your brother around in your life feels better than sinking that sweet hole-in-one out on the golf course. 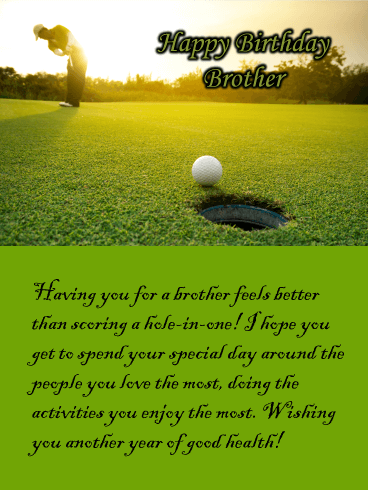 Let him know you feel that way by sending him the Hole-In-One Happy Birthday Wishes Card. 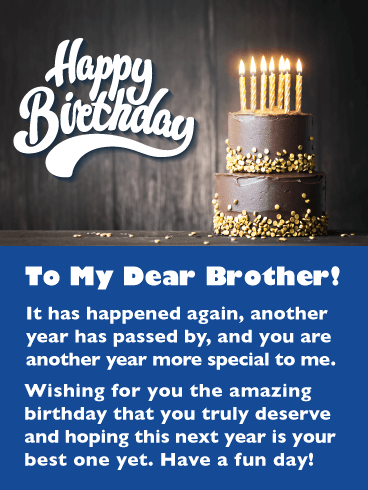 Let your brother know that you think he is wonderful, generous, kind, and loving with this outstanding birthday card. It will truly mean so much to him. This greeting card was designed with creative lettering, bright stars, and thoughtful words. Perfect to send to the brother that means so much to you. Let him know you are wishing him a bright day by getting this exceptional birthday card out to him today. Vroom vroom beep beep! Your brother is one cool guy. 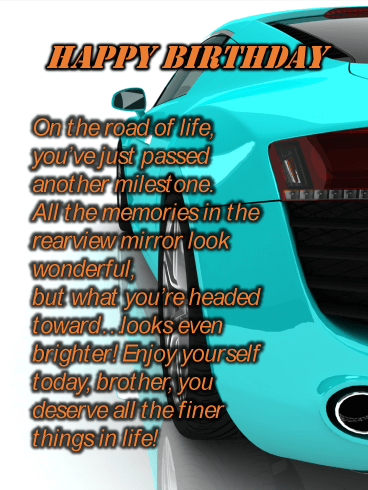 Send him a birthday card that matches his cool personality with the blue Sports Car Birthday Wishes Card! Looking back on fond memories is wonderful, but this card will remind your brother to look toward the years ahead with joy and enthusiasm. When you’re a sports car it’s easy riding! Some brothers just can’t get enough good literature. We hope these amazing bookworms get their birthdays off from work to enjoy a day catching up on their novels! 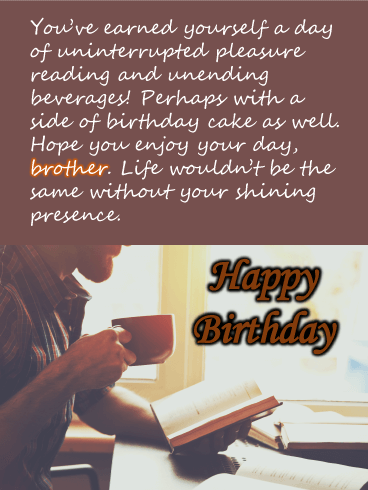 Be sure to send your literary brother this Happy Birthday card featuring a man reading a book with a mug of coffee or tea to get them excited for their own quality book time! Just remember to check on him and slip him some cake at some point during the day! What do you get for the man who seems to have it all on his birthday? Why a super great birthday card that’s what! Send your dapper brother this charming Man Who Has Everything rhyming wishes card to let him know you didn’t forget his big day! Fancy shoes, a stylish watch, high end liqueur, it’s all there on the card along with wishing him a huge party with all his friends! 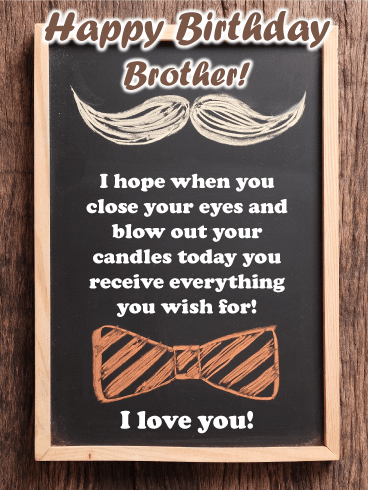 Send a little excitement over to your dear brother with this exceptional happy birthday card! He will love the sparkling frosted cupcake and the fact that you are thinking of him on his big day. 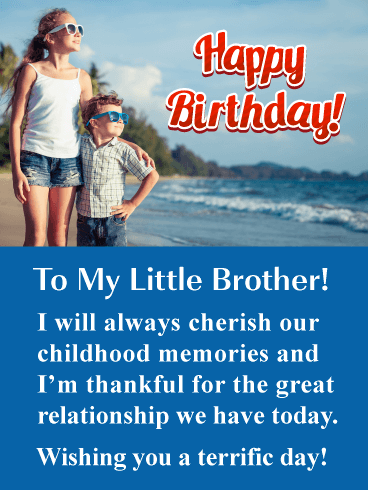 This birthday card contains a thoughtful message that will thank your brother for always being there for you, no matter what. It will touch his heart and make his birthday even more special. I mustache you a question, and I won’t shave it for later! Haha. In all seriousness though, the question is: does your best brother have a birthday coming up? Then you’ve got to send him this super cool chalkboard sign Happy Birthday card! Let him know how much you want his wishes to come true with mustaches and bow tie chalk drawings! Your brother is a real go-getter. He’s accomplished a lot of goals and has many more on the horizon. 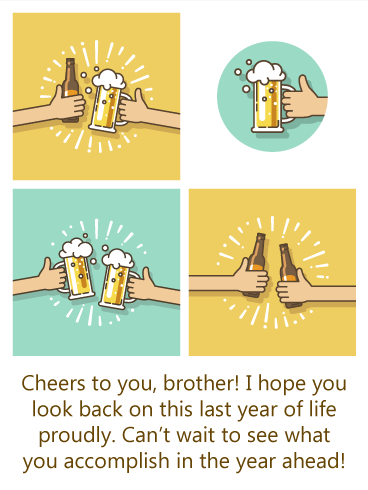 Celebrate all his hard work and achievements this year by sending him the Cheers to Beers Happy Birthday Wishes card! Featuring plenty of frosty beer mugs and bottles clinking joyfully. Raise a glass and make a toast to the sibling you love the most! 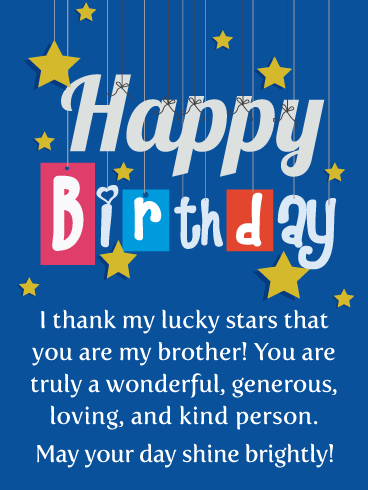 Brothers and sisters have a special bond when they are young, and if you are lucky enough to still have a close relationship with your brother, then this birthday card is for you! It showcases siblings spending quality time together on the beach. So sweet. This meaningful birthday card expresses that you will always cherish your childhood memories together. He will certainly appreciate a wonderful birthday card such as this.